The Good, The Bad and The Deadly is one of five classes that will be offered by the Asheville Mushroom Club (AMC) during its annual FungiFest, which will be held September 18 at the North Carolina Arboretum. Meet Your Mushrooms: The Good, The Bad and The Deadly—an introduction to fungi, 9:15 a.m.-10:15 a.m. Cost: $15 for the public – $11 AMC members. Recycling & Composting with Mushrooms: Learn how to grow mushrooms using ordinary household materials, 10:30 a.m.-11:30 a.m. Cost: $17 for the public – $13 AMC members. Cooking with Mushrooms: Enjoy a cooking demonstration and tasting featuring recipes from the cookbook “Cooking with the Asheville Mushroom Club,” 11:45 a.m.-1:15 p.m. Cost: $19 for the public – $15 AMC members. Medicinal Mushrooms for Immunity and Well-Being: Discover the health benefits and medicinal uses of mushrooms, 1:30 p.m.-2:30 p.m. Cost: $15 for the public $11 AMC members. Growing Your Own Shiitake Mushrooms: Master the basics of drilling, inoculating, stacking and caring for shiitake logs, 2:45 p.m.-4:00 p.m. Cost: $15 for the public – $11 AMC members. The AMC was founded in 1983. The club motto is “fun, fungi, friendship, forays, freedom and spaghetti.” By the end of 1983 membership had grown to 11. But those 11 kept foraying and having fun – not to mention learning a lot about mushrooms – and today there are probably more than 100 dues-paying members. The Western North Carolina Nature Center at 75 Gashes Creek Road in east Asheville has been home to the AMC since its inception. Monthly meetings are still held there from March through October at 7 P.m. on the second Wednesday of each month. Meet5ings are free and open to the public. Forays, on the other hand, require membership. 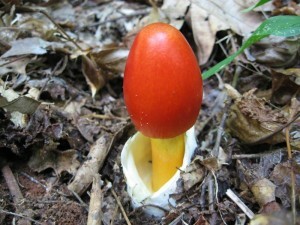 To learn more about the AMC drop in on one of their meetings, check out their website at http://www.ashevillemushroomclub.com/index.asp or visit the FungiFest at the Arboretum for a little fun, fungi and friendship. Class space at the FungiFest will be limited. To register please call 828.665.2492, Ext. 314 or go to www.ncarboretum.org.